Hot damn you guys, I just went on a serious biscuit bender. Almost three days spent in the lovely and oh-so-charming city of Charleston, South Carolina, and let me tell you: biscuits biscuits BIIIISCUITS. There is many a mile to be spent on the treadmill in atonement in the weeks to come . Yes, weeks. That’s how much biscuit binging went down this weekend. I let southern comfort food snuggle me in its warm, loving bosom and it was nice. Real nice. Callie’s Hot Little Biscuits was just a small counter to order from and a narrow bar up against the biscuit themed mural painted wall, with people pressed in tight to get their hands on some homemade biscuits. There were small, slider-sized biscuits, larger fist-sized biscuits, sweet ones and savory ones, filled and sandwiched. Biscuit heaven in all its southern glory, if you ask me. We got the gloriously messy Southern Lovin’ sandwich, made with a big ol’ buttery biscuit, a juicy, hunk of fried chicken, a perfectly runny fried egg, and a small sea of warm made-fresh-right-there, sausage gravy. With sticky fingers, crumbs everywhere and a losing fight with a plastic fork, we agreed this was not date food. But dates be damned, this was a sisters trip and that biscuit was phenomenal. As a slightly sweeter finish to the first of our biscuit feasts, we went with an order of two small buttermilk biscuits, stuffed full and oozing with dark, delicious blackberry jam. Obviously neater and less challenging to eat, these might’ve fooled someone into thinking we were just two nice girls taking a morning biscuit break. Bless their hearts, they had no idea we were just getting started on a carb-fueled bender. Seriously, Italy who? I have a new love, and with its unabashed, carefree sloppiness and finger-licking deliciousness (totally not just a phrase but an actual truth in this situation), the Mile End breakfast burger just snaked its way into my heart, leaving behind a trail of egg yolk and English muffin crumbs. And happiness. It’s sloppy, but really. WHO. CARES? 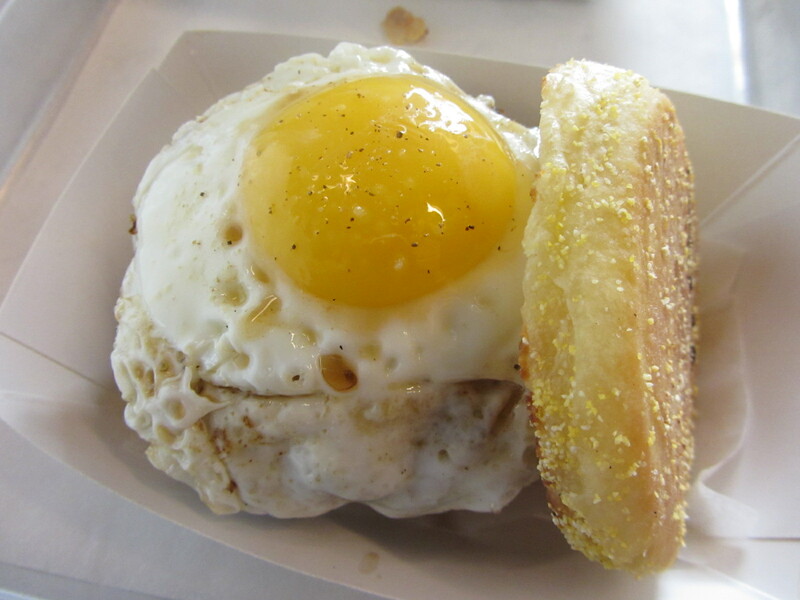 Served every day but only until 4pm (which is a shame cause I would eat this bad boy for dinner ANY day), the breakfast burger is a handsome, juicy veal sausage patty, topped with an over easy egg and further perfected with melted Quebec cheddar, warm apple butter and the sweet touch of maple syrup, all of that— yes, ALL of that— between two soft, perfectly crumbly English muffin halves. There’s no way to eat this without ending up a complete gooey, sticky, crumby mess, but it’s worth it. So worth it. 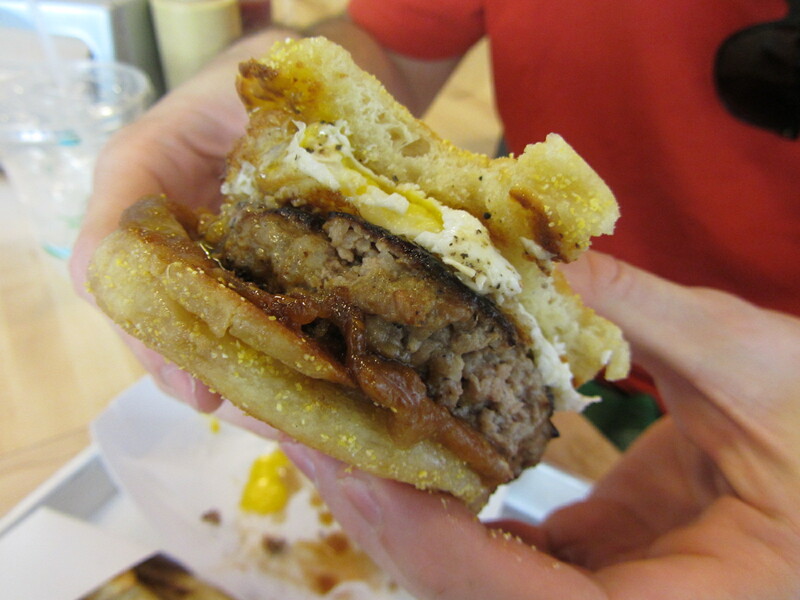 I mean really, you and me, breakfast burger, we could have a good thing here. It’s been a bit quiet here on the blog front. I last left those of you that care and drop in ocassionally with a post about me stuffing my face full of pie. (Feel free to re-read below.) Shortly after that, possibly as I was digesting said pie, I realized that while I always feel like I could shed a few pounds (who doesn’t? ), as of lately I really have been feeling like a monstrosity of a whale. No, really. A giant, fat, pie-scarffing whale. 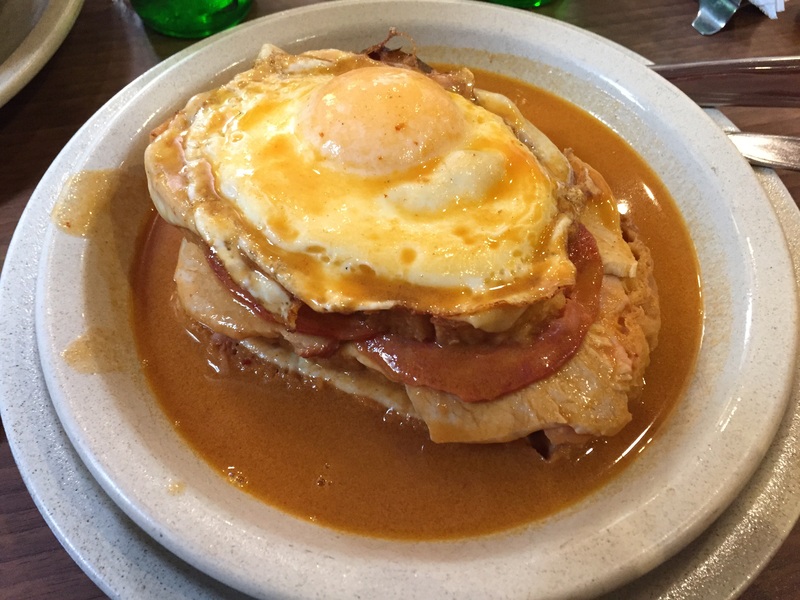 But on this so-called “diet” (ugh, what a dirty icky word), I get a couple of breaks from the healthy world and during those moments of freedom I like to dive head first into the world of delicious, gluttonous and reckless abandon. Enter The Queens Kickshaw. I’ve been harrassing my friend Daphne about going with me to the Queens Kickshaw for monts, since they’re both in Astoria, and last week, during one of my eat-whatever-and-however-I-want meals, we finally did it. We went and had ourselves some mighty fine grilled cheese sandwiches, which are what the Queens Kickshaw specializes in. Egg & cheese sandwich... why can't there be a diet based on this guy? They had a classic mozzarella and cheddar version (complete with the requisite tomato soup) and some mouth-watering (no really, like a slobbering dog) sandwiches with cheeses like manchego, gruyere and fontina and other ingredients including avocado, anchovies and mushrooms. But when I saw egg and cheese as an option, I was sold because, really, it’s practically impossible to go wrong with such a delicious marriage of foods as eggs and cheese. It’s just always awesome. Always. But this wasn’t your average corner store $2 egg and cheese sandwich that you eat when you’re hungover and on the way to work. No no. 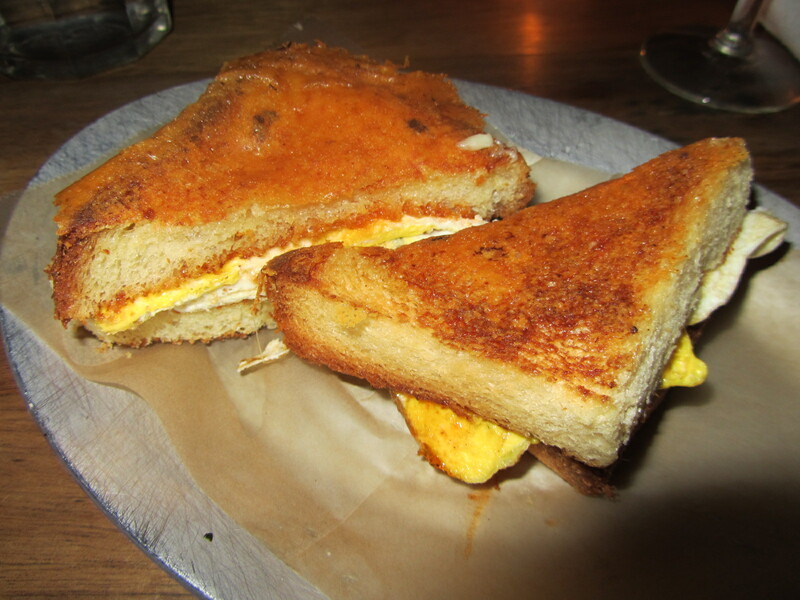 This was creamy ricotta, gruyere, egg, thyme and a sweet, slightly spicy maple hot sauce, all between soft, warm brioche. Let me tell you, people, there’s nothing that will make you hate a diet more than the mere thought of a grilled cheese sandwich like that. I want to take ten of those sandwiches, stack them one on top of the other, unhinge my jaw like a python, and eat the whole cheesy, eggy mess. And it would be glorious. Until the next break from healthy eating, I’ll continue daydreaming about a world where I could be rail thin and still eat grilled cheese and egg sandwiches all day long. Sigh. A girl can dream.